Delicious, glorious flan. My absolutely favorite dessert. It’s a Vietnamese favorite, and I grew up eating flan out of little plastic cartons. 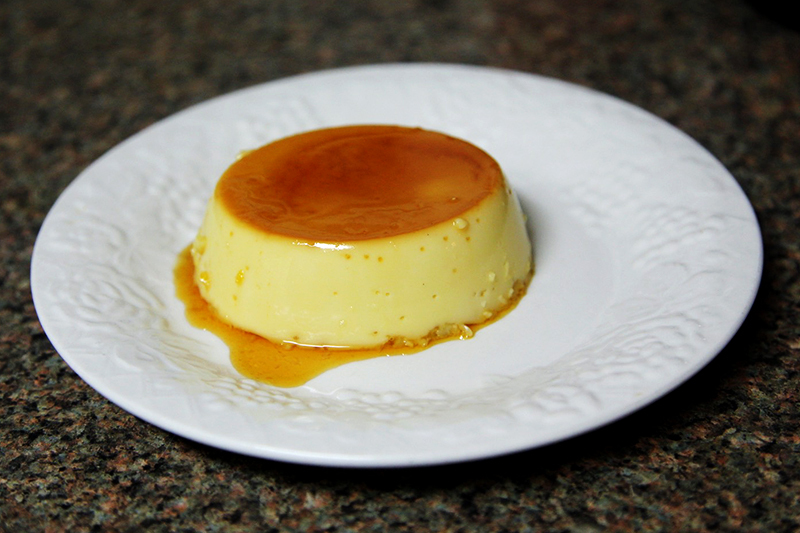 When I was growing up, my mom made flan all the time. And now I live on my own, I crave it from time to time. 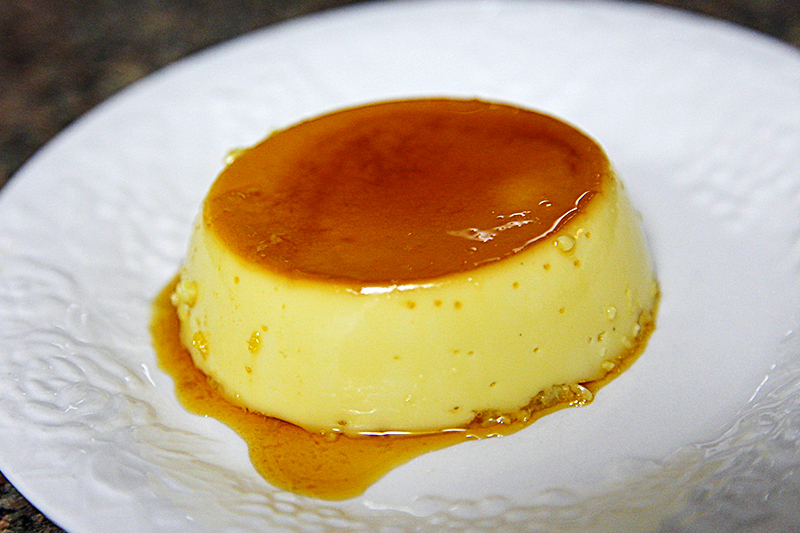 Creme caramel was introduced to Vietnam by the French. We call it “banh flan” or “kem flan.” No matter what it’s called, it’s just amazing deliciousness, and it’s best served cool, especially when it’s been sitting in your fridge for 24 hours. Nice and cold. So, what’s the secret of making the perfect flan? DO NOT BURN THE CARAMEL! It’s as simple as that. once you perfect creating the caramel sauce, you’re golden. In a saucepan, cook the sugar over medium low heat until it begins to melt. Lower the heat, and swirl the pan to make sure the sugar melts evenly. Tip: don’t use any utensils, as they will get coated with hardened sugar. Swirl the pan to melt the sugar evenly is the best way to do it. Once the sugar begins to caramelize, you need to watch it, as it can go from golden to burnt very quickly. As soon as the sugar begins to brown, turn off heat and continue the swirl the pan. Pour the hot caramel sauce into your oven-safe ramekins. Tilt the ramekins so that the caramel coats the bottoms evenly. Allow the caramel to cool and harden. Place your ramekins inside a larger oven-proof pan. Pour hot water into the pan. The water should come up halfway on the sides of the ramekins. In a large mixing bowl, whisk the eggs. Add the cans of condensed milk and evaporated milk. Add the tablespoon of vanilla extract. Whisk well to blend them together. Bake in the oven at 350 degrees F, for 40 minutes to one hour. Check the oven for doneness. The center should be set, but the flan will still jiggle a little bit. Check the oven often; you don’t want the flan to overcook. Remove the ramekins from the hot water and let cool on a rack. Refrigerate for at least 4 hours. Flan tastes the best when it is chilled. Run a knife around the edge of the ramekin. Place a plate on top of the flan, and flip over, so the plate is on the bottom. Lift and enjoy!